Our client is a very large semiconductor chip manufacturing organization in the world. To keep track of the different artifacts associated with their software product lifecycles they had been using a few multi-vendor and some homegrown proprietary ALM tools. To solve the issues of good interconnectivity between these tools and prevent information and execution silos, the Company had for some time, decided on and implemented a point – to – point (P2P) integration model and create pairs of integrated enterprise tools or bridges. As the projects to be integrated grew into hundreds, they found it difficult to manage this workload and support and be responsive to their end users who had integration customization needs for different projects every time they started a new project or adopted new tools. This is when they started looking for a better and more efficient integration solution. The point to point integration solution is a complex tightly coupled system and thus each enterprise tool pair required an average of few months to setup. The long initial integration setup time resulted in additional effort and cost for each pair. The other reason for the above complexity was the hardcoded nature of the P2P application. Each configuration setup required dozens of configuration files mostly in *.xml formats to be changed and tailor made to fit the integration logic. For a generic user, to setup and maintain such a setup was an immensely difficult task. The headcount for creating new integration bridges kept rising. The system eventually reached a complexity level that required developers to support and fix in case some component went down. Besides this, the P2P solution suffered from the same negativities that plague any other P2P solution today –lack of flexibility and scalability. With a hardcoded P2P solution, any change ranging from a simple change in URL of the tool to a version / API changes of any of the tools required the P2P solution’s configuration files to be re-configured if not changed as a whole. Such problems with the P2P Integration Solution made the company rethink their strategy and explore a less complex yet scalable solution. Among several Integration options the Enterprise Service Bus – ESB approach is currently the most flexible and hence the coveted one. Kovair with its Omnibus ESB Integration Platform is one of the leading Integration vendors and has been helping organizations globally with their application tools integration needs. Kovair Omnibus Integration Platform was the choice of this customer after a very extensive and thorough review that matched their criteria of flexibility, high productivity, scalability and end user’s accessibility and most importantly a low coupling architecture. Besides this, Kovair’s Omnibus Integration Platform has been proving its worth across multiple enterprises in various industry verticals including networking, telecom, manufacturing and financial organizations. Kovair Omnibus Integration Platform was installed on premise in the customer’s servers. 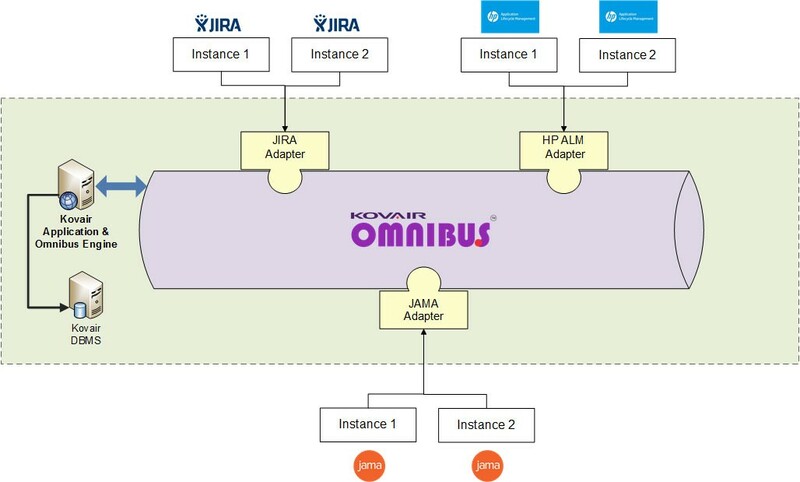 Kovair Omnibus n-tier architecture allowed separate VMs to be used for the installation of the different components like database, application and the adapter / connectors for connecting the tools with the ESB integration hub. The infrastructure provisioning and installation was followed by the initial Integration configuration to setup a few bridges by the Kovair team. Nearly, 90% of the configuration can be managed right from a web based interactive UI. The other 10% comprises of the integration logic which was not a part of the generic omnibus integration behavior and can be overridden with some minimum work in the configuration files. Multiple disparate bridges that had to be separately maintained and managed previously can now be managed from inside a single ubiquitous application interface. Each bridge installation setup time is reduced from 6 months to 16 – 32 hours depending on the complexity of the bridge. In dollar terms, this amounts to a saving of about $48,000 per integration. The company has hundreds of integrations and as such the dollar savings can run into a few million dollars for 500 projects over a period of two years. In terms of flexibility and scalability too, the Omnibus proved to be beneficial. The neatly distributed n-tier architecture of Omnibus made it trivial or major changes like the change in any integration logic or changing the tool / adapter details from the view level of the application. This spared the user the pain of directly interacting with the “middleware” as was the case with the P2P solution where the user needed direct interaction and changes at the architectural level of the solution. Monitoring and troubleshooting too is made easy with Omnibus, since the built in monitoring reports and dashboards allow the user to have graphical and textual view of the integration process both on a discreet record level or a holistic bridge level. Within a quarter of introduction of Omnibus, nearly 80 bridges have been setup in the Development environment and they are being successfully deployed in production based on the priorities. Productivity and Notifications – The time and cost that were saved in the process due to adopting Omnibus Integration platform is now being leveraged to further increase productivity. Due to the automation that can be included alongside the default functionalities mechanisms like mail notification in case any integration encounters an error has drastically reduced the manual maintenance overhead. The accumulated data has been successfully replicated and stored in separate database which forms the basis of a massive analytics project called Data Lake. As a part of this project, that entire accumulated data can be used in various tools like Tableau to have the basic data modelling as well as defining advanced predictive analytics to find meaningful pattern out of the data. Delivery Quality – The benefits of using Kovair has raised the delivery quality and expectation benchmarks of the organization who now have found the way to use the Omnibus Integration platform for creating an intelligent DevOps solution as well. The customer is convinced that moving from their past practice of point to point integrations and customizing them for multiple project needs was a significant time and resource savings that they are happy to experience and at the same time better serve their internal end users and speed up company’s product development cycle. Their initial skepticism and very extensive scrutiny of Kovair has been converted into a very successful and pleasant experience. They are now focused on prompt conversion of old integration methodology to the Kovair Omnibus based integration implementations at a rapid pace by convincing more and more business groups within the company to adopt the new methodology at the earliest available opportunity. Kovair feels good that after an extensive scrutiny and a very thorough technical evaluation of all aspects of the Kovair Omnibus and associated ALM Platform it has a very happy world class customer. This should encourage other semiconductor and high tech product companies to adopt Kovair for their development tools integration needs without hesitation for prompt benefits along the lines noted here.